Hornick Studios takes pride in capturing your son or daughter’s special day with professional high definition digital equipment to ensure the best picture quality available. We will videotape and artistically edit your video with tasteful digital effects without overwhelming your video to provide an excellent video on BluRay DVD to cherish forever. Satisfaction guaranteed. Hornick Studios invites you to visit and preview samples of work for clarity, color, sound, and artistic talent or go to preview our samples in the Screening Room. 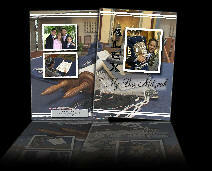 Hornick Studios looks forward to working with you to make your son or daughter’s memories last forever. Most Temples/Synagogues will not allow videotaping during the actual service, there for we offer to videotape the rehearsal so you will be able to have the Haftorah and Torah portion captured on video. This is also a great opportunity for us to get photo images to use for the case cover. We offer editing together a Photo Montage and we can present it at your celebration with a 10’ foot wide rear projection screen for all your guests to see. Add your favorite songs to your montage. Use the large screen to display your name in a vibrant color with animation as your guests arrive. Our Artistic and creative digital computer editing process allows us to incorporate tasteful digital effects without overwhelming the video. We can even put together a highlights re-cap of your Mitzvah day. Provide us with your music taste for a more personal video. We offer interactive DVD’s with custom motion menu’s that include linked chapter marks that will take you right to the Introductions, Ha-Motzi, Candle Ceremonies and more. We also include personalized custom printed cases for all our DVD’s. Preview DVD menu samples in our Screeninig Room.